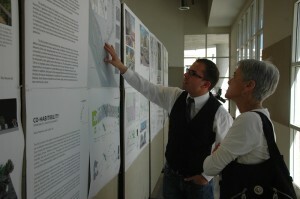 A student from the CityLab studio explains his project to Dean Geraldine Forbes Isais. 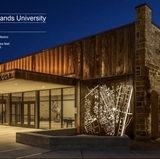 The UNM School of Architecture and Planning recently opened an exhibition at ABQ+UNM CityLab, located at 505 Central Ave., featuring development, revitalization strategies and site-specific projects along historic Route 66. 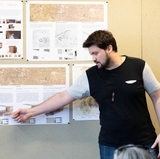 The exhibition is work from the inaugural multidisciplinary studio, Root 66, which brought together architecture, landscape architecture and community and regional planning - the three disciplinary areas of the school. 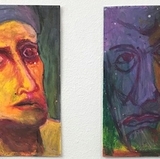 Geraldine Forbes Isais, dean, UNM School of Architecture and Planning, said, "The exhibition was presented for the City of Albuquerque staff to come by to see the students' work, evaluate it and talk with the students. We believe it's a mutual goal to have student interns continue to work in CityLab and with the city."